“The West –the very words go straight to that place of the heart where Americans feel the spirit of pride in their western heritage-the triumph of personal courage over any obstacle,whether nature or man.” John Wayne. The term Ranch Grown Logic is hard to explain until you come face to face with the common sense of it all. Ranch Grown Logic is just that, the logic that I grew up with living on a ranch is western Montana. 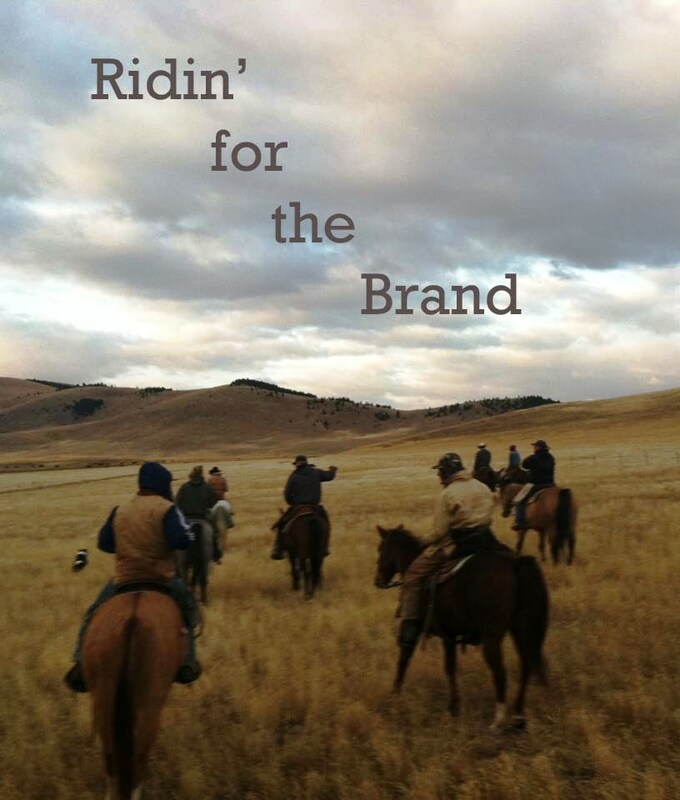 It is not rocket science, but a common sense approach to life, branding and marketing, that is best explained by saddling up. Back at the ranch the ride today is shipping day, one of the best days of the year for ranchers, its pay day! There are also other great days to be championed on the ranch, like the last day of haying, or the day you turn the cows out to green grass, or come to think about it just about any other day you find yourself in the saddle and loving what you do. We began this day in appreciation of the value of this day, celebrating not only a rancher’s work year cycle culminating in pay day, but also celebrating a job well done for a year’s hard work and dedication to family, land, and livestock. The joys, sacrifices, and the passion that fuels a lifestyle become a reality on shipping day, a family affair; this day stops and starts the year. The day began with words of instruction as my brother Joe headed out of the house, talking while walking on. “Be patient, wait till 8:30 then come to the corral.” Dressed to go to work we remained patient and had another cup of coffee. The “be patient” directive came in reference to timing but also bringing in the heard. Bring the heard in a quiet and orderly fashion; the words not said, but understood. The plan was methodic in the approach and strategic in application. We met at the corrals, our horse trailers in a row, cowboys and cowgirls made up of relatives and neighbors joining forces in a common goal to get the job done, our task to bring the calves in without a hitch. Riding for the brand, we headed out on a cool brisk morning towards the cattle which were separated into different pastures of steers and heifers. That part of the preparation for shipping day had been done in advance so we could bring them into the corrals in bunches, the heifers would come first. Horses are often “fresh” on mornings like this, cool, crisp, frosty, it takes a little time and miles to get them warmed up. In all honesty they can feel the anticipation as much as we do its horse sense. Your horse is your partner and no truer words have been said that “the best thing for the inside of a man is the outside of a horse,” but no one ever said it was going to be easy. About 30 feet inside the gate, where the heifers were pastured, was a swampy ditch to cross. Not a small one at that, it was about 3 feet wide and deep with swamp and rock on one side and swamp on the other. As I followed the other riders across the ditch my horse balked, after a little coaxing he jumped the ditch almost propelling me into next week if you know what I mean. Oh great I thought, I have a jumper and on a fresh morning like this a good jump sometimes lends itself to “let ‘er buck!” But luckily all went well and my focus went to splitting the heard, creating manageable numbers for sorts and trip to the scales. The first cut went smooth and the cattle were moving out nicely, but now it was my turn to cross the ditch once more, and in rides trouble. My horse “G” short for Gentleman was going to have no part of it. I made the attempt and nothing. Looking at the crossing and assessing the distance, rocks and swamp, I determined in my mind that it was not looking pretty. The clock was ticking in my head; I did not want to be one to let the crew down. I made another attempt and nothing, and as fellow cowboys saw what was taking place my brother John took his horse over the ditch as to show my horse the way, but no luck-no way. Another place to cross I thought, I looked for options, whatever it takes (WIT), ride the ditch till you find a better crossing but this ditch provided no options, and time was moving forward, this was it! There he was frozen in his tracks, reminding me a lot of business ventures and life when we sometimes get frozen in our own tracks. Afraid to take the step, looking for reasons why we can’t do something instead of reasons we can, and the route to make it happen. I heard my brother on the other side say “Look at me, look up.” That was it, Ranch Grown Logic; I knew it when I heard it. Look at where you want to go, not down, not at the issues that threaten, that you think are deep, swampy or rocky. Focus on your vision. Begin at the end then make you plan and work that plan. I took a deep breath of confidence for me and my horse and I looked ahead. I looked up at my brother on the hill. One small leap for my horse resulted in one giant step for my appreciation of Ranch Grown Logic! I smiled at the common sense of it all and I headed in with the heard. With the leap of faith I froze that image in my mind. 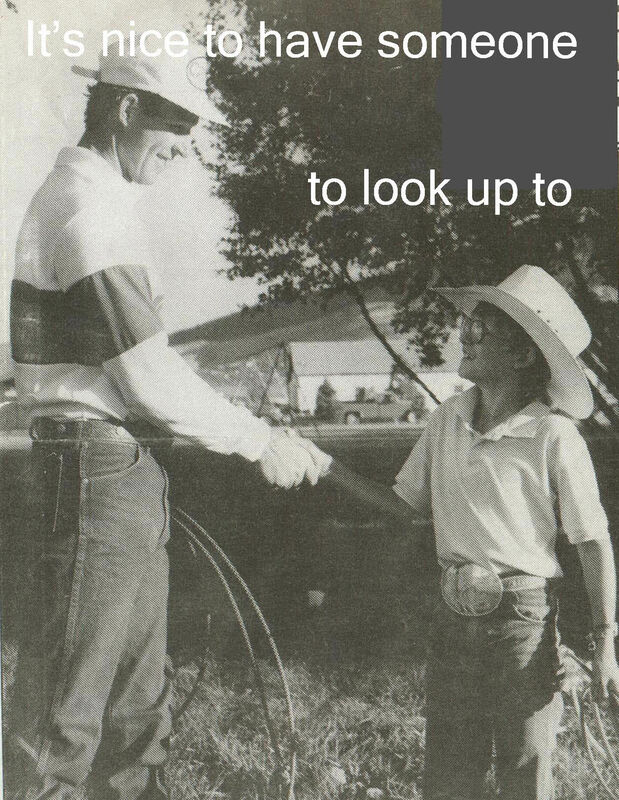 “Sit tall in the saddle; hold your head up high. Keep your eyes fixed where the trail meets the sky, and live like you ain’t afraid to die. Come along on the trail of stories that journey into the heart of the ride; marketing, branding, motivation, inspiration as told through stories built on a collection of experiences. Ropin’ and rooted in the spirit of the West, Ranch Grown Logic is a common sense approach to marketing utilizing authentic, motivational, passionate, branding insights and stories of the West. This morning I was thinking about all my friends, family, and colleagues that attended the 2011 Wrangler National Finals Rodeo and how Facebook had linked them to me. I knew almost instantly who was winning an event, receiving images as they posted the action. It was an honor to see my nephew, Tyler Erickson receive his PRCA Rookie of the Year in Steer Wrestling buckle and title in the arena. Thanks to my Facebook friends postings and what I saw on GAC, (side note, they did a great job with the WNFR- TV coverage) I was there! I thought back to last year at the WNFR as I did some posting from the finals. New to the game, I did not know whose voice to use, business or personal. I was tentative; my postings were more like whispers as I tested the water. That is unusual, because my voice, around our house, is sometimes known as “Judith Gap, “an inside family joke! I was learning the ropes of social media, looking back now it was more branding than conversation, and frankly found myself lacking the confidence and the guts to go all in. Truth be told, social media waits for no one. It is an instant conversation where I found myself frustrated by what I thought; I could not, instead of focusing on what I could do. Social media started out as a trickle that has turned into an ocean. I admit I was afraid to put my toes in the water and just jump in. But as I have learned this new wave is waiting for no one, and to be relevant an online presence is a necessity requiring guts and time. Social media is the new frontier, breaking trail for expression, business, value and connection. Back some 20 years ago the Wagner family had a white 4-horse stock trailer that we used for everything and that we jokingly put a decal on the front of that read: NO FEAR. I loved seeing that trailer go down the road. Then it came to me, thanks to that memory, spend less time defining who you are and more time being who you are. NO FEAR I am, who I am. I have always enjoyed marketing and telling stories. Story telling by nature, I write like I talk. I admit my wordsmithing leaves a little to be desired but I write with a passion that is heartfelt. It came to me ….It’s WIT, Whatever It Takes; I am going to start my own blog and business Facebook page centered on WIT using Ranch Grown Logic. My goal, through this platform, is to build a network of likeminded people in the western lifestyle and western industry connected through stories, mentors, and leaders, with emphasis on value based marketing, branding, motivation and inspiration. I am who I am, a marketer and a cowgirl who enjoys telling stories. Now is the time to pull my boots on, grab my hat, get on my horse, and ride the trail. Social media is the new frontier changing the way, the story, and the ride of the future. All trails start with the first step: NO FEAR. You are invited, come along for the ride. Attract people by creating value. Social networking is effective and personal and business branding platform for online presence and online outreach.